From the Memories of Ireland Collection, Burren from Below was captured along the West Coast of Ireland, a bit north of Doolin. 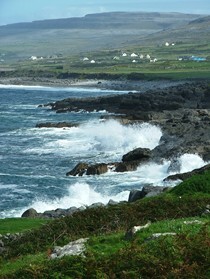 This shot includes the waves crashing upon the rocky coast, with a quaint town just beyond the shore and the statuesque Burren in the background. This photo print is 8 x 10 and is available as a photo print, a Giclee canvas print, both mounted and framed, or loose. This is a part of the Memories of Ireland Collection.